Jan Sjunnesson is an author and teacher born in 1958. He has written a number of books and one of them just happens to be in English and revolves around, you guessed it, Sweden. Seeing as I have just read it I figured i’d give you a little book review. The book then delves into 1000 years of ancient history crucial to understanding the present-day. You will learn about the countries surprisingly early democratic origins not to mention Kings & Queens, civil strife, unions and everything inbetween. Focus is then shifted to the 1930’s to the 1970’s and in particular the Social-Democrats who ruled uninterrupted for 44 years, making them the world’s longest-serving democratically elected government. In this chapter politicians of the present can learn how to remain neutral during a world war and how a media monopoly is crucial to controlling the minds and hearts of your people. However, even before the internet age alternative sources emerged and in Sweden it came in the form of boat broadcasting illegal radio from international waters. In other words rebellious Swedes had their very own “Boat that Rocked” (watch it if you haven’t already). Moving on; the book delves into anti-Americanism, the youth protests of the 60’s, the red aristocrat Olof Palme and world renowned sexual liberation. The latter seems to have worked wonders considering our pensioners are going at it now more than ever according to recent research. The author dubbed that chapter “Hubris” which brings me to the next one “Humiliation”. The name stems from Sweden going from being one of the richest countries in 1970 to 20th place by the year 2000. Something Jan attributes to the experiment of Prime Minister: Olof Palme. This chapter was particularily interesting with a solid explanation of how the schools became dumbed down and an amusing list of Social-Democratic scandals such as but not limited to prostitution, drug-dealers, shady extrajudicial intelligence agencies and the world famous children’s author Astrid Lindgren being forced to pay tax amounting to 102% of her income. The following chapter focuses on recent history and the Moderates rebranding themselves as “The New Workers Party” thanks in part to a spin-doctor who goes by the name Schlingmann. 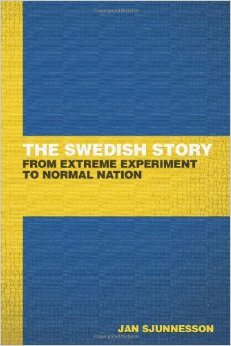 If you aren’t interested in learning about history but want to understand Swedishness, wether or not Fox News was banned in Sweden, and what the “Society for Cutting Up Men” is, skip straight to chapter 6. I reckon Sjunnesson wanted to do his home country justice and I’d say that he can pride himself on having done so. The book is methodical and informative with 12 pages of footnotes revealing the blood, sweat and tears behind it. On the flip side it was a tad academic at times but I suppose that comes with years of being a teacher (no pun intended). You can read the first chapter on his blog but if don’t have the time for that check out the extract below. Another true story of Pär the Swede and Mauricio the Latino from 1978 will further explain the extreme Swedish modesty and honesty. Latin American economic historian Mauricio Rojas travelled with a Swedish friend to the UK, a few years after he had escaped Pinochet’s Chile. In Sweden they had gone out for drinks and food together and split the bill, each paying for his due the Swedish way. Rojas told his friend Pär that now when they were going abroad, he would like to pay the bills as he had somewhat more cash and wanted to live more the Latin and European way. Pär agreed after some doubts and drank on the behalf of his friend at the English pubs. On the flight home however, Pär could not stand the pressure from his self-inflicted duty to relieve himself from being bound to anyone, not even his friend Mauricio. Pär exclaimed that he owed him 150 Swedish crowns for all drinks and foods during the visit, as he had been counting every pint and fish n’ chip. 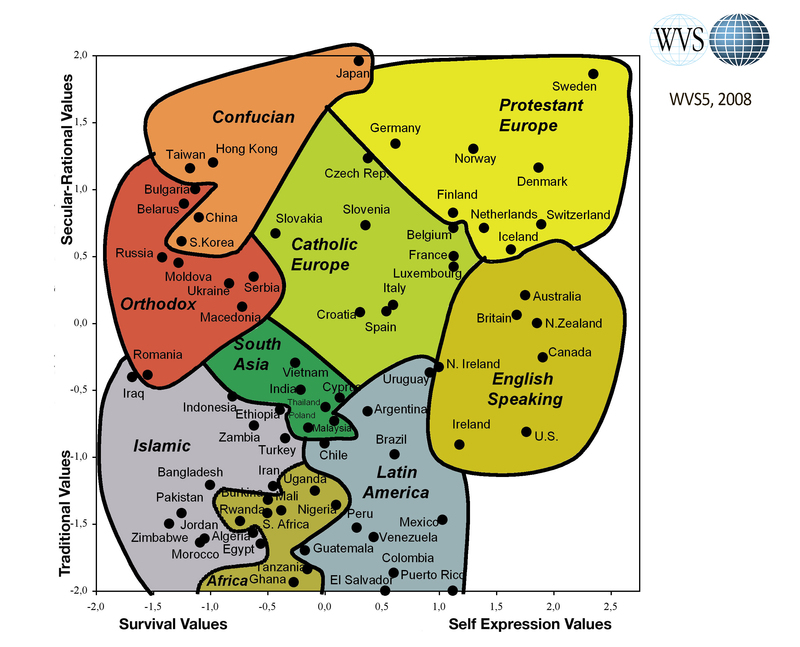 “Map of World Values” I discovered via the book. Where is your country at?